I woke up today at the same time as our family’s life-changing event exactly one year ago. 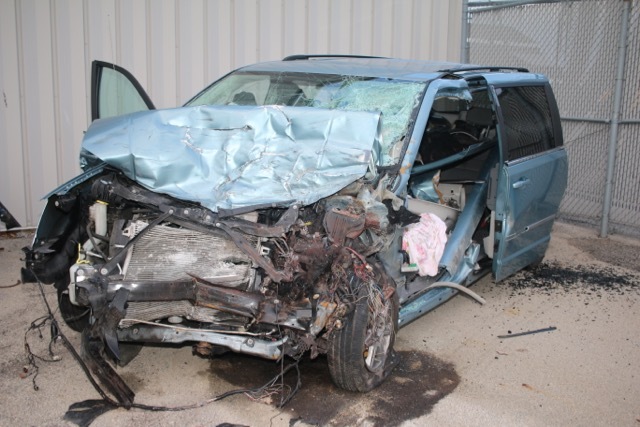 At 9:00AM on Thanksgiving morning, 2015, my wife Heidi and our daughter Megan were the victims of a deadly head-on collision on County A about 5 miles north of Appleton, WI. I was in the Wausau area at Heidi’s parent’s house waiting for Heidi and Meg to arrive for our family holiday. Unfortunately, I received a phone call from a stranger who told me “…your wife and daughter were in a car accident…”. This was the worst news I have ever had to deal with. My bride of 22 years and our 18-year-old daughter faced death in the face at 55 mph with no skid marks. Megan was awesome. She was able to give my phone number to the person on the other end of the phone. I was also able to talk to Megan hearing that she and Heidi were alive. The emergency personnel were incredible. Megan was transported to the hospital rather quickly after they got her out of the van. Heidi took the brunt of the impact and was trapped in the dash. 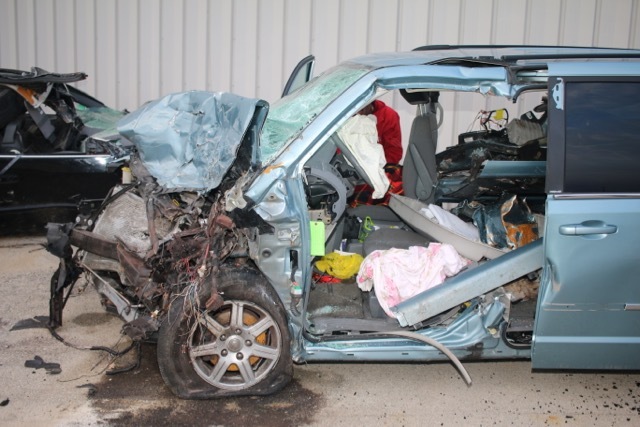 It took 45 minutes with the Jaws of Life to safely remove her from the wreckage. There was a lot of fog that morning so the helicopter could not be dispatched to the scene of the accident. Separate ambulances took Heidi and Meg to Theda Clark Medical Center in Neenah, WI for emergency care. Meanwhile I was driving from Wausau to Neenah dodging deer hunters and managing multiple phone calls to the sheriff’s department and emergency room trying to learn the status of Heidi and Megan. Megan was injured but discharged from ER a few hours later. Heidi underwent emergency surgery on her left leg/hip due to severe dislocation and massive trauma. The next day she was strong enough to go through her first major surgery to repair broken bones, specifically her acetabulum and clavicle. She also had numerous lacerations, broken ribs, a bruised lung, and other injuries that happen with a major car accident. She spent a week in the hospital and then the entire month of December at a nursing home to rehab. We brought her home on December 31, 2015 and she began the long road of healing. But she was not able to do any weight bearing on her left leg for 12 weeks. I was her primary caretaker as Megan continued her senior year of high school. Our daughter, Erin, had to return home from college at Illinois State University as we could not afford to keep her in school. Our lives had changed dramatically. In addition to caring for Heidi my new full-time job was paperwork — dealing with insurance, financial aid, attorneys, and trying to keep up with the generous outpouring of support and assistance from friends, family, and strangers who were praying for us and supporting us financially. We were truly blessed and able to make it through the winter months because of faithful and generous donations of gas cards, cash, and other tangible gestures of love. Many of these came from people and churches that we have never known or met. Words are not enough to express my thanks for those who helped us! In the late spring of 2016 Heidi was doing very well. She was compliant with her therapy and began walking. Her pain was well managed and she was making great progress. During this time I began the process of looking for employment. I was quickly discouraged. There seemed to be plenty of jobs available but the pay was no more than I was making over 20 years ago…and these were so-called “professional” positions. After a couple of months of serious job searching I decided, by necessity, to start my own business. I brushed off some old technical skill sets and started BIZ Technology Service LLC in June of 2016. During the summer Heidi began to have complications and increased pain associated with walking. Her hip was not doing well. We were once again on the roller coaster of discouragement. She continued through the summer months with increasing pain and we later learned that the top of her femur had begun to die. This necrosis was a result of the trauma from the accident. A new hip was the only option, something that she was trying to avoid. In October of 2016 we selected a specialist in Milwaukee to perform a challenging reconstructive hip surgery. Today Heidi is walking without crutches or a walker; she is relatively pain free and healing quickly. One of our many challenges during the past year was navigating the world of insurance and laws surrounding how funds are used to pay medical bills and the like. This is not a fun process. We secured a very good attorney immediately after the accident knowing that this would not be an area that we could understand or deal with. Even with the best attorney the process is very painful and not very fair Everybody wants there piece of the pie and you get kicked when you’re down way too many times. To make matters worse, the driver at fault died at the scene of the accident and he was not insured. In fact, he was driving on a suspended license and operating a vehicle titled to his girlfriend. She also did not have insurance on the vehicle he was operating. All this to say, make sure you have good uninsured/underinsured policies on your vehicles. All of our claims (and they are significant) have been submitted to our own insurance. Our policy will be paying out the full amount toward Heidi’s claims and she will still not be made whole (legal talk for covering expenses and loss). In other words, the bills, pain and suffering, and other factors with the claim far exceed the amount that our policy will pay out. For example, just one of many bills that we received was over $70K! We will have some healthy “closure” soon as we complete the insurance claim process soon. But we still have looming questions about the accident, the person at fault who tragically died, and other questions that will probably never be answered. Why did he cross the centerline? Was he texting? Why can’t we hold others accountable for allowing him to drive the uninsured vehicle? Why does Wisconsin law not allow us to use policies on other vehicles we own (a bad law)? Along with the accident we were finally able to sell a house that we had on the market for nearly two years. Because of the accident were unable to keep up with mortgage payments. We barely avoided foreclosure but lost all of our equity that had been built over the past 20+ years. The accident wrecked our credit too. We are fortunate to have nice “things” but we have gone from very comfortable to nearly wiped out financially. The good side of this part of our journey is that we live in a country where we can start over and be successful. So that’s what we are doing. We are starting over and rebuilding…because we can and we must. One thing I’ve learned in the past year is this — life moves forward and if you don’t accept that you will live in pain…emotionally, financially, spiritually, and physically. Face your fears head-on, don’t run away, be honest with yourself and move forward. Get proper medical help and seek wise counsel even for simple everyday things, if needed. Make good decisions about the present and the future, and stay connected with trustworthy friends and family. This is critical in times of despair and trauma. It does get better! A year later I am sitting at Heidi’s parent’s house with my bride of 23 years and our 19-year-old daughter. We are waiting for other family members to arrive, hopefully safely, and this is no longer something that I take for granted (safety on the road). I write this to shed some details on our life during the past year. For many of you who have wondered why this couldn’t be shared earlier please understand that we were in the middle of crisis. We also had to be careful about how we shared information because of the legal/insurance issues that we were dealing with. Now that the dust has settled, and we are nearing the end of our claim process, it’s a little easier to reveal details. All of this to say, I have so much to be thankful for on this Thanksgiving of 2016. I am thankful for life, for the life of my wife and daughter. I am thankful for friends, family, and faith. I am thankful for the many people who sent simple but much-needed gas cards, Wal-Mart gift cards, and the like. You were lifesavers for us! I am grateful for a handful of people who I consider close friends — you know who you are — your prayers and phone calls sustained me through the worst part of my life. I am thankful for incredible emergency workers, paramedics, firefighters, nurses, and doctors who treated Heidi and Megan (and me too). I am thankful for a social worker at the hospital who truly cared and managed so many things for me on that day. I am thankful for an old car that I bought with cash reserve that is still running and a great friend who helps me with mechanical work for the cost of pizza and tools — you are awesome! I am thankful for the professionals at Herrling Clark Law Firm in Appleton (I know, free advertising, but worth noting). I am thankful for a specific “new” friend in the past year that has walked beside me and allowed me into his world too — we have shared loss and joy together in ways that far exceed the amount of time we have known each other. I am thankful for friends who traveled a long distance to be with us in the hospital on the day of the accident and have been praying for us regularly, you are special in our lives! I am grateful for family with a special shout out to some dear cousins (who I have not seen in decades) who reached out and shared love with us. For my in-laws and other extended family — you are always in our thoughts and we love you all! I am thankful for our landlord who has been very understanding and generous of our situation. I am also thankful (politics set aside) for financial and medical support from the State of Wisconsin — it’s not a perfect system but we are very humbled and glad to have this help available to us as we rebuild. My life verse if Philippians 4:13, which says “For I can do everything through Christ, who gives me strength.” The all-important context of this verse is that Paul is talking about being content in having little or much. He has learned to have this contentment, in any situation, only through faith in Christ. I continue to strive for this contentment in all situations. Hug your family today, consider increasing your uninsured/underinsured policies on your vehicles, be careful driving, and be thankful! Brian you continue to be an inspiration. Not because of what you say, but because of what you do. As you look in the mirror, you have so much to be proud of, because of what you have accomplished. In all of the furor of your last year, your character has been again revealed. Judy and Doug have so much to be proud of and the rest of us can simply try to follow your lead. Keep on keeping on buddy. You do it humbly with style and grace. Thanks, Steve. Great to hear from you, appreciate your kinds words. Thanks for the Thanksgiving update — indeed, God’s grace oozes throughout this story.. We’ve prayed for you and your family often. In my experience, as the years roll you’ll see His grace evermore clearly. Happy Thanksgiving. Thanks for the prayers, love to your family, miss you. Hi Brian thak you for sharing ive been thinking and praying for u both. Hope ur day was awesome kiss my cuzin 😉 for me. Brian Hugs to you and Heidi and family. Thank God that Heidi and Megan survived this awful tragedy. Praying that God will continue to surround your family with the only protection he can give. Our prayers for your family have been answered! Your family and faith are an inspiration to us all and a testimony of our Heavenly Father’s abundant faithfulness and love. If there is anything I can do to help, please, do not hesitate to ask, I am excellent at making coffee and emptying the garbage, I am also a good listener and cleaner, I love your family much and would be honored to help in any way possible. I too have access to gas cards. My phone number is the same, I live in Kimberly now.